Sometimes it really makes us hate the game Grand Theft Auto V cause of failing time and again in the same mission for many many times. So how to pass that mission? Here are some GTA V Cheats which will help you pass the mission you were stuck in. 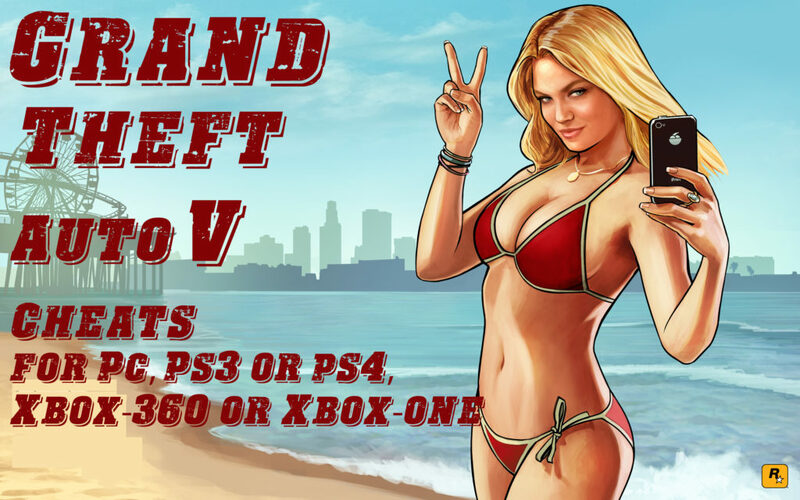 GTA V Cheats for PC, PS4 & PS3, Xbox! These are the cheats for Grand Theft Auto V which you can use them in PC, Xbox (360 or One) or PS3 and PS3 while you play the game to help you beat the all the missions. However, you should note that using these GTA 5 cheats may stop you from gaining certain achievements and trophies. Lower Wanted Level: R1, R1, CIRCLE, R2, RIGHT, LEFT, RIGHT, LEFT, RIGHT, LEFT. Raise Wanted Level: R1, R1, CIRCLE, R2, LEFT, RIGHT, LEFT, RIGHT, LEFT, RIGHT. Spawn BMX: Left, Left, Right, Right, Left, Right, X, B, Y, RB, RT. Spawn Buzzard: B, B, LB, B(3), LB, LT, RB, Y, B, Y. Spawn Caddy: B, LB, Left, RB, LT, A, RB, LB, B, A. Spawn Comet: RB, B, RT, Right, LB, LT, A(2), X, RB. Spawn Duster: Right, Left, RB, RB, RB, Left, Y, Y, A, B, LB, LB. Spawn Limo: RT, Right, LT, Left, Left, RB, LB, B, Right. Spawn PCJ-600 (motorcycle): RB, Right, Left, Right, RT, Left, Right, X, Right, LT, LB, LB. Spawn Rapid GT: RT, LB, B, Right, LB, RB, Right, Left, B, RT. Spawn Sanchez (Motorcycle): B, A, LB, B, B, LB, B, RB, RT, LT, LB, LB. Spawn Stunt Plane: B, Right, LB, LT, Left, RB, LB, LB, Left, Left, A, Y. Spawn Trash master: B, RB, B, RB, Left, Left, RB, LB, B, Right. Change Weather: Y, Left, Right, Right, X, RT, RB. note: Enter the Weather cheat multiple times to toggle through rain, clouds, clear days and snow. You can spawn more than one vehicle at a time. Skyfall: LB, LT, RB, RT, Left, Right, Left, Right, LB, LT, RB, RT, Left, Right, Left, Right. note: This cheat code spawns you in the air for a skydive free fall, but no parachute. Moon Gravity: Left, Left, LB, RB, LB, Right, Left, LB, Left. note: Enter a vehicle after enabling this code to experience less gravity. Press B after jumping to float. Slippery Cars: Y, RB, RB, Left, RB, LB, RT, LB. Slow Motion: Y, Left, Right, Right, X, RT, RB. note: The code can be entered up to four times to increase its effect. Enter it a fifth time to disable the GTA V Cheats. Explosive Bullets: Right, X, A, Left, RB, RT, Left, Right, Right, LB, LB, LB. Explosive Melee Attack: Right, Left, A, Y, RB, B, B, B, LT.
Flaming Bullets: LB, RB, X, RB, Left, RT, RB, Left, X, Right, LB, LB. Lower Wanted Level: RB, RB, B, RT, Right, Left, Right, Left, Right, Left. Raise Wanted Level: RB, RB, B, RT, Left, Right, Left, Right, Left, Right. Invincibility: Right, A, Right, Left, Right, RB, Right, Left, A, Y to be invincible for five minutes. Max Health & Armor: B, LB, Y, RT, A, X, B, Right, X, LB LB LB. Slow-motion Aim: X, LT, RB, Y, Left, X, LT, Right, A. Fast Run: Y, Left, Right, Right LT, LB, X. Fast Swim: Left, Left, LB, Right, Right, RT, Left, LT, Right. Super Jump: Left, Left, Y, Y, Right, Right Left, Right, X, RB, RT. note: Hold X to jump very high. Important note: GTA V Cheats is not gonna work on GTA V Online. So these were all The GTA V Cheats that are played on any platform and Hope it was beneficial for you, if it was beneficial you can let me know in the comment section and if it wasn’t beneficial you can suggest me a better way because I pleased to read all of you dears’ comments.